Many years of teaching Art and Design in Secondary Education has provided me with rich insights into numerous aspects of the visual arts. Against this background, my own specific interests as a practitioner have found inspiration in a wide range of periods of art history and modes of representation. It is a passionate involvement with what might loosely be described as a cubist aesthetic which has so often characterised my most intense and rewarding painterly achievements where diverse, man-made and natural stimuli are interpreted through experimentally abstracted imagery. 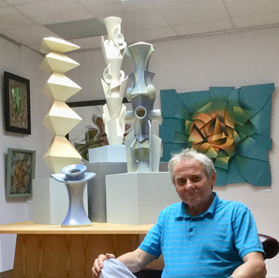 Now able to operate on a full-time basis, I have recently seized the opportunity to extend my fascination for geometric fragmentation, rhythmically intersecting planes and the ambiguous articulations of negative space into the area of sculptural ceramics. In this context, my aim is to integrate my two and three dimensional work into one developmental whole without either media being subservient to the other. Actively encouraging a two way dialogue between these facets is proving to be an exciting and challenging area of exploration. 1969 - One person show at Madeley College Gallery. 1971 - Joint exhibition Doncaster Art Gallery. 1973 - One person show at Doncaster Art Gallery. 1980 - Joint exhibition at Church View Gallery. 1994 - One person exhibition at Doncaster Art Gallery. 2000-2007 - Regularly exhibiting at Doncaster and Barnsley Open Exhibitions. 2008 - Joint exhibition at Bradford Gallery. 2009 - Joint exhibition at South Square Gallery, Thornton. 2010 - Joint exhibition at South Square Gallery, Thornton. 2010 - Open exhibition at New School House Gallery, York. 2010 - Final MA Show at Bradford Gallery. 2011 - Open exhibition at Bar Lane Gallery, York. 2011 - LFA Group exhibition at North Light Gallery, Huddersfield. 2012 - One person show at Whitestone Gallery, York. 2012 - York Open Studios. 2012 - Joint Show at Norman Rea Gallery, University of York. 2012 - LFA Group Exhibition at North Light Gallery, Huddersfield. 2013 - LFA Group Exhibition at North Light Gallery, Huddersfield. 2013 - One person show at Pocklington Arts Centre, York. 2013 - York Open Studios. 2014 - York Open Studios. 2014 - LFA Group Show at Shine Gallery, Leeds. 2014 - One person show at York Hospital. 2014 - LFA Group Exhibition at North Light Gallery, Huddersfield. 2015 - York Open Studios (April). 2015 - LFA Group Exhibition at Dean Clough, Halifax. 2015 - LFA Group Exhibition at Zilah Bell Gallery, Thirsk. 2015 - Summer Exhibition at Wolds Gallery. 2016 - York Open Studios. 2016 - LFA Group Exhibition at Dean Clough, Halifax. 2017 - LFA Group Exhibition at Dean Clough, Halifax. 2017 - LFA Group Exhibition at Cooper Art Gallery, Barnsley. 2018 - LFA Group Exhibition at Dye House Gallery, Bradford. 2018 - YAWA Group Exhibition at Pyramid Gallery, York. 2018 - York Open Studios. 2018 - LFA Group Exhibition at Dean Clough, Halifax. 2018 - One person exhibition at Blossom Street Gallery, York. 2019 - LFA Group Show at Huddersfield Art Gallery. 2019 - LFA Exhibition at Dean Clough, Halifax. 2019 - LFA Group Show at Blossom Street Gallery, York. 1989 - Giving talks on art critical studies at Yorkshire inset courses. 1990 - Published article in N. Yorkshire arts teaching journal. 1992 - Illustrated report on artists' residencies circulated throughout Yorkshire. 1994 - Articles published in local art teachers' journal. 1995 - Organised and led course in art for Primary teachers. 2001 - Led inset days on classroom display techniques. 2004 - Led 3 full day ceramic workshops on theme of Cubism. 2009 - Carrying out workshops in Yorkshire Secondary schools. 2011 - Giving workshop tuition at The University of York. 2011 - Illustrated talk given at York Art Workers Association. 2012 - Continued Ceramic Tuition at The University of York. 2015 - Volunteer at Centre of Ceramic Art (York Art Gallery) .